So, building on my previous post, What is a patent?, I’m going to discuss some of the reasons why lawsuits happen due to patents. Depending on how long this discussion is, I may or may not get to how this impacts technological innovation. If I don’t then I’ll cover it on Monday. 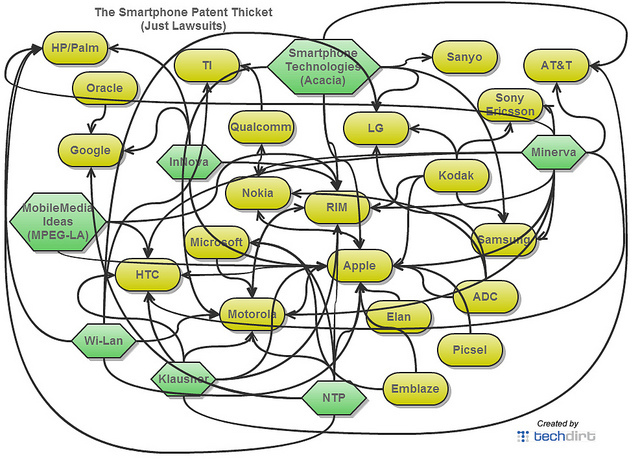 Starting again with this lovely drawing from Tech Dirt of all the law suits related to smart phones I’ll discuss how something like this can happen. As I mentioned in the previous post patents are to be awarded for non-obvious, novel, useful ideas. This can be extremely difficult to actually judge. For instance, there is a patent owned my Smuckers that describes a method to crimp the edges of a peanut butter and jelly (PB&J) sandwich with the filling layered in a specific order. So, let’s say you’re a patent examiner. You’re a technical expert in some field, the one related to food processing perhaps. How would you look for examples of prior art? Where prior art is articles, technologies or anything that does the same process. For crimping a PB&J sandwich where would you start? Well, in this case the examiner wasn’t able to find anything and awarded the patent. However, there are two problems with this. This is a fairly obvious way of making a PB&J sandwich. I’m sure many people ate sandwiches like this in their youth. The other problem is that there was a company in Michigan that had been making these from the 1800s, which means it’s not novel. Once the patent was awarded Smuckers sued this little ma and pop restaurant over patent infringement. For more information on this exact story please read Jaffe and Lerner’s Innovation and Its Discontent (2006). In the Smucker’s example presented in this way, it’s fairly obvious that this patent shouldn’t have been awarded in the first place. However, it was. So that means the only way to invalidate the patent is in court. However, this can be extremely expensive. According to Jaffe and Lerner (2006) these law suits account for roughly 25% of R&D expenditures and that many lawsuits cost hundreds of thousands of dollars regardless of the fine or impact to production. While this case was straight forward more advanced technologies are much more difficult to analyze in this fashion. 1. A computing device, comprising: a touch-sensitive display; a processor; memory; and one or more programs, wherein the one or more programs are stored in the memory and configured to be executed by the processor, the one or more programs including instructions for: playing-back a video file on the touch-sensitive display; displaying a play progress bar on the touch-sensitive display, the play progress bar including a timeline indicating a time span of the video file being played; detecting two touch points making initial contact at respective initial positions on the play progress bar; detecting the two touch points moving away from each other on the play progress bar; and, in response to detecting the two touch points moving away from each other on the play progress bar: expanding a portion of the play progress bar in accordance with the movement of the two touch points, wherein the portion of the play progress bar that is expanded is determined by the respective initial positions of the two touch points; and contracting a part of the play progress bar outside the expanded portion. This basically is how most people are interacting with their phone to zoom in for pictures or whatever. However Apple is claiming that this specific gesture is unique to this patent because of the specific application of the gesture. Fortunately, this patent has not been granted yet and I hope that this does not get granted.This is a software patent and it’s difficult to say if this will be granted or not. Regardless of what I want, this patent may be granted. With the broadness of the first claim it is difficult to tell what sort of impact this patent would have on the smart phone industry and could introduce additional lawsuit from Apple towards firms like Google, HP, HTC, Microsoft, etc. Additionally, with the wording of this claim it is difficult to say if there aren’t other patents that have a similar claim to being unique. As you can tell these claims leave a lot of wiggle room and can increase the likelihood of a lawsuit in a fast growing new technical area. These new technical areas are still being explored as firms are patenting technologies related to it. In many cases the Patent Office hasn’t fully decided if specific types of patents should be allowed. Tomorrow I will look at some of the potential impacts on innovation of this type of patenting. ← What is a Patent?